Liam North got custody of her six years ago. She&apos;s all grown up now, but he still treats her like a child. No matter how much he wants her. Her sweet overtures break down the ex-soldier&apos;s defenses, but there&apos;s more at stake than her body. Every touch, every kiss, every night. The closer she gets, the more exposed his darkest secret. She&apos;s one step away from finding out what happened the night she lost her family. One step away from leaving him forever. Loved it...!!! Why, why, why, didn't I scan some of the reviews this time...!!! Cliff-hanger... Usually I don't buy the first book in a series without checking it has an ongoing romance - I like to wait until all the parts have been released. Sigh, hurry up MAY...!!! I think it is fair to say that we see a sweeter side of Skye Warren in Overture. I am more accustomed to Skye’s darker and kinkier works in previous books. Samantha, a talented violinist has spent her early years with a father who treated her as an afterthought. With his passing, child prodigy Samantha is taken in by Liam North. At the beginning it is not really clear as to why. The years that follow, sees them falling into a seamless routine with Liam as her guardian and Samantha as the studious and well behaved ward. This all begins to unravel with Samantha turning 18. This is a delicious coming of age story where Samantha on the cusp of womanhood can no longer deny her feelings for Liam and nor can he…. I loved this story!!! Liam North is everything you could possibly want in a protective alpha male. The more I read, the more my heart ached for him. His past has coloured his present and he keeps his distance with people. No one more so than Samantha. He protects her with rules but then again perhaps he is protecting himself from her. Samantha is a sweet young woman who more than anything wants to be seen as a young adult and not a child. She is still innocent in many aspects and yet, wise beyond her years. This line is everything. It can be applied to anyone. Anyone in love. This was a real stand out line for me that continued to stay with me. There were many incredible characters in this story including the other North men: Josh and Elijah. All the North men are different and yet similar. There connection and interactions are interesting to watch. I did love the other North men but Liam holds a special place for me. I wasn't sure if anything could be as good as the Trust Fund Duet but Skye Warren has proven that she is magical in her writing. The amount of detail and care taken to create such a beautiful story is to be commended. The trivia we learn about the violin world is brilliant because I've always loved the instrument. But we also learn about Liam's past as well as Samantha and how their paths crossed for the first time. While there is an age gap between them and their attraction is taboo, it never felt tainted and wrong. Perhaps it's because Samantha makes the choices. As Liam said: *"Because I made rules and she followed them, but that was always her choice. I only ever had as much control as she gave me. "* The two of them certainly share a bond with both of them having difficulty childhoods but I think their bond goes beyond that. Samantha softens the harden soldier and shows him love. Liam cares enough for Samantha to give her everything she needs and knows that she needs to fly and so refuses to stand in her way. But I love them together! And just as I was reaching the end, I was blown away by a revelation and found myself saying: WHAT THE HE...!!!! I am bursting, absolutely bursting, to read the next book to find out what happens to Liam and Samantha! Skye Warren has created another fantastic story which captured my attention and imagination from page one. I’m just going to say.....buy this book....OMG what a story! Liam is the owner of a business that specialises in dangerous missions around the world, in short a group of mercenaries. As Samantha’s birthday approaches, Liam feels more guilt around why he took her in, feels more for her period.....so not as a guardian should for a ward under his care. What a delicious taboo treat and a great start to a brand new series from Skye. I simply could not put this down! Although there is an age gap between the it is nothing too extensive and I must stress although Liam was Samantha’s guardian for some years he is not in any way related to her. Liam is very complicated and hides some dark secrets behind hid guardianship. He is disciplined, mysterious and has a fierceness about him when it comes to his feeling for Samantha. Samantha although young is still very mature as a result of her neglected upbringing, she is very delicate and broken and can’t wait to see her character develop over this series. 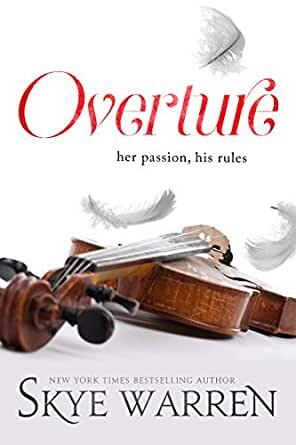 I love forbidden romance, there is so many layers to this story though and something tells me we have only scratched the surface and I cannot wait to get my hands on the next book in the series.